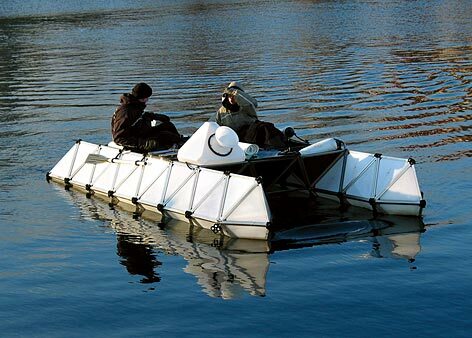 MODULAR BOAT is a low cost system that enables persons to stay and transport themselves and various cargos on water. It can be moved by hand using paddles, by sails and by various motors. The motor used in this version is powered by electricity. The batteries are charged by solar panels. It delivers a maximum speed of 5 kilometers per hour (approximately 2 knots). Because the boat is constructed as a catamaran, it is very seaworthy. The boat is lightweight and the materials are highly durable. 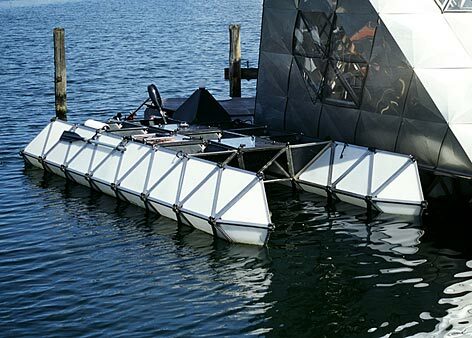 The MODULAR BOAT is constructed from a space lattice system of stainless acid resistant steel (see "Manual for N55 SPACEFRAME"), which combines optimal strength with low weight. Tetrahedral and octahedral polyethylene tanks are used for constructing the floats including the stem. Half-octahedral tanks are built into the deck that connects the two floats. In combination with polycarbonate lids, they provide flexible space for different functions and items: ladder, anchor, seats, tables, stowage, compass, battery containers, etc. These functions can be fastened and moved around as desired. With the addition of a rigid deck, the MODULAR BOAT can function as a pontoon bridge, or as a floating platform for various constructions on water. The size of the MODULAR BOAT can easily be adapted to one's requirements. The number of plastic tanks in the floats may be varied, but it is necessary to secure sufficient buoyancy for the planned tasks. The boat is connected to solar panels that charge one of the two batteries within a few hours. Fully charged batteries can each power the engine at full speed for about 1 1/2 hours. 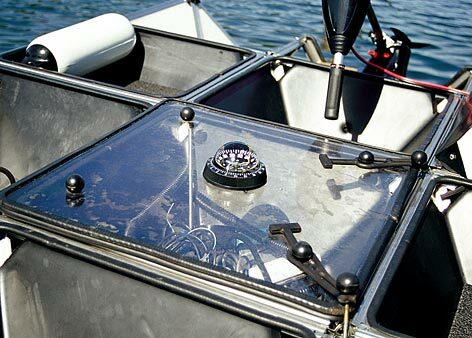 The MODULAR BOAT requires no special maintenance apart from occasional cleaning. If the boat is stored on land, the steel parts must be washed in fresh water. Since the surface is untreated, barnacles and seaweed will grow on the boat. The friction thus caused results in a drag on the speed of the boat, which is less energy-efficient. In this case, one can remove the organisms mechanically from time to time. MODULAR BOAT, stowage, compass and table. Various bolts, nuts, discs, stainless, acid-resistant steel.